"Long before Chase had ever heard of Monsuno, scientists were performing extensive tests on the all-powerful Monsuno essence. One such scientist, Dr. Moto, tried to create Monsunos of her own, but the experiments went horribly wrong. Trapped in an icy lab for years, Dr. Moto has continued her terrible experiments. Chase, Bren and Jinja have no idea about the horrifying creatures they are about to stumble upon." I like Brian Smith but this one didn't do anything for me. I read it the day before I sat down to write this review and can't remember a thing about it. 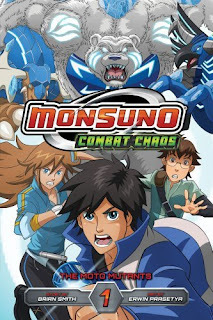 Browsing through it I remember it's about kids who have animal creatures as their fighting partners, this is the Monsuno, and of course there is a bad guy. Usual type of fighting thing, there is of course a card game, etc. that kids can get into. One thing I did like is that this book ended with a "to be continued", as most of these vizkids series books are standalone stories. I'll probably read the next one to see if it gets any better.